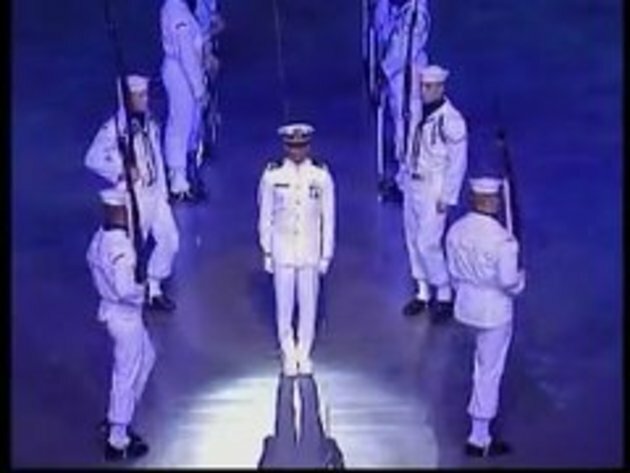 The US Navy Ceremonial Guard Silent Drill Team was invited to compete in an International Tattoo in Norway in May of 2009. The Navy competed against military units from all over NATO and won first place. Once you watch the 3-1/2 minute video you’ll understand why they won. Sound on. 41 comments posted so far. Login to add a comment. That must have took a lot of training... Impressive show. This and the USMC Silent Drill Team are very impressive to watch. Especially in person. Thanks for the up load USAnumber1. years and years of training and cooperation. thousands and thousands of push-ups and chin-ups. jeez .. very very impressive!! but srsly hasn't anyone waited for one @ 1:25 to hit him ? Now do it again, with big glow sticks and add some music to it. dont these acts belong in circus??? what they are doing . r they playing with gun ? Wow this was boring, thought there was going to be something cool somewhere in the vid having read the sub title. hmmm ive seen cheerleaders do it better! conclusion: this is completely silly. at 1:27 you know the sword guy really needs to trust the other guys, he really does. #19 Too bad you can't see the beauty in precision, You don't get this but you probably are the kind that go crazy watching a bunch of grown men kicking a ball around a field, a lot of point to that. It's good to see our trillions of dollars, global recession, and imperialistic USA policies used wisely in song and dance. way better use of guns than shooting with them, very impressive show ! That gun looks really heavy.. Even if the bayonet isn't razor sharp, that thing would still do damage. I guess as long as they are anti American it's OK. This goes to show that you CAN turn a person into a robot if you want to. Good show. anyone got a link to the rest? / full show? #(removed comment) CleverBastard,back again so soon? Esta mesmo muito bem feito, devem ter treinado mesmo muitoi!! thanks for the upload! very impressive indeed. -" Hold on, I cant find my roll of tape." Gaffer-tape, the best way to attach thrusting blades on rifles. Ok so how is this gonna help them sail boats?